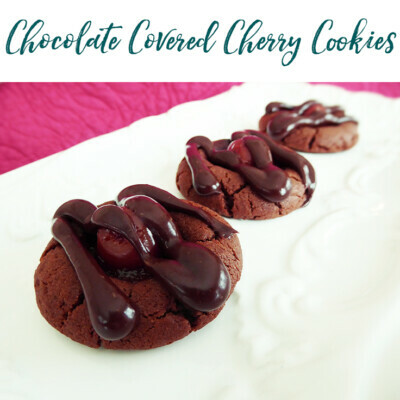 Chocolate Covered Cherry Cookies are delectable, delicate, and doable with your kids! They represent the state of Washington where the majority of sweet cherries are grown and, like each of the recipes in “A Taste of America”, have both a niche for special holidays and everyday occasions alike. Into each bed of cookie dough is nestled a cherry. And, what is the best part of chocolate covered cherries? The chocolate! These cookies are no different. Drizzled onto each chocolate cookie is a rich crown of ganache. Into a medium bowl, sift dry ingredients together. Set aside. In a large mixing bowl, beat together butter and sugars until fluffy. Cream in egg, then stir in vanilla until thoroughly combined. Add dry ingredients to wet ingredients in two to three increments, mixing until thoroughly combined. The dough will be stiff at this point. Roll dough into 1” balls and place on lined baking sheets. If you don’t have a cookie scoop, a level tablespoon measure of dough produces the perfect size. Press an indentation into top of each cookie, and place a cherry in the center without an excess of syrup. Bake for 9-11 minutes, until just set on the perimeter. Baking beyond this point will result in hard cookies. Remove from oven and cool on baking sheet for five minutes, during which time the cookies will continue to bake. After cooling for five minutes, transfer to cooling rack to completely come to room temperature. While the cookies are cooling, go ahead and make the ganache icing. Over low heat, in a small saucepan, melt together chocolate chips and sweetened condensed milk. Remove from heat once melted. Add almond extract and grenadine (if using). Stir until smooth. If necessary, add water to reach desired consistency and allow ganache to partially cool. Spoon slightly-warm icing into icing bag (or Ziploc bag), then cut off small corner. Squeeze icing back and forth over tops of the completely cooled cookies.